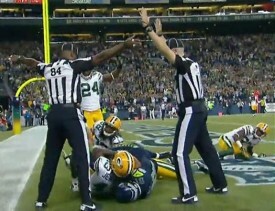 I feel sorry for those replacement refs. Wanting to be a replacement ref would be like me wanting to be the CEO of Boeing or Microsoft for a few weeks. This is cool, I might say for a time. The extra pay is helpful. The taste of real power is exhilarating. But then suddenly, in the heat of a major decision—involving thousands of employees, millions of customers, investors ready to pounce—I would probably say, yikes, get me out of here. I’m in over my head. That’s what the replacement refs must have been thinking last Monday night. But there is much more to think about in this ref-for-a-day infamy that has drawn such passionate attention across our nation. That iconic photo—with one replacement ref signaling a touchdown, arms shot straight up into the evening air; the other, arms waving in every direction but up, calling the catch an interception and therefore a touchback—that photo might stand for something really big. We might call it an emblem for the nature of truth in our day. Our postmodern culture says everything is up for grabs. What is true is always a matter of interpretation. The Green Bay Packers will forever believe the call was utterly mistaken. The Seattle Seahawks will take the win (“Well, that’s the way the refs called it. Nothing we can do.”). But the real truth of the matter was squirming and scrambling on the field. Somebody had possession, somebody didn’t. I think back on the O. J. Simpson trial. By far the majority of African Americans felt O. J. was innocent, while the majority of whites thought he was guilty. Aside from the issue of race in our culture, this sorry episode said something about the nature of truth. That woman’s throat was slit, and either O. J. did it or the killer is still on the loose. The important thing isn’t about how we interpret the matter. Something happened. Something is true. We think often in our culture these days about the existence of God. The New Atheists vehemently proclaim, once again, the death of God and the dangers of religion. The response of the faithful is passionate as well, though often on the defensive these days, up against a culture decidedly, almost fiercely, secular. “God exists because I talked to him this morning,” the faithful say. Of course the truth is open to interpretation, as it always has been. Perception is real. Of course this calls for intense debate, reflection, and discussion about what is true, as it always has. I for one revel in that important discussion. But in the end, it is not just debate and discussion and perception. We have to decide. Something is true and something is not. Lesslie Newbigin gets this right: If this postmodern bent “leads us to abandon as hopeless the search for truth, then our culture is dying. . . . To abandon hope of speaking truthfully about reality is to abandon the adventure of life.” We must in the end care what happens. We must care about actually finding the truth. I know this is not what the poor replacement refs are thinking about these days. They are just glad to get back to their high school football games. But perhaps this whole extraordinary incident can help us think about the bigger issues of what is true and how we finally know. Folks in Green Bay don’t think everything is just interpretation. They believe they caught the ball.